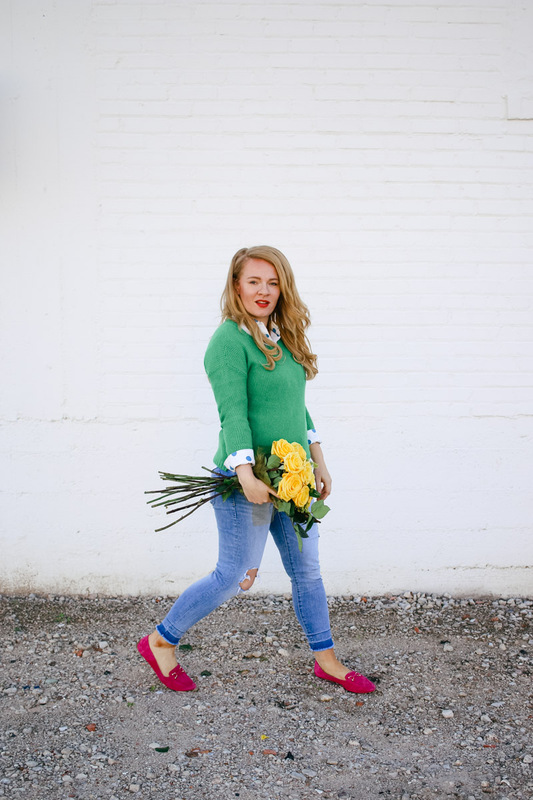 Even in the most casual of days, you will probably find me with pops of color. I tend to be more cheerful when wearing happy colors, so I gravitate towards items with fun pops when building my wardrobe. 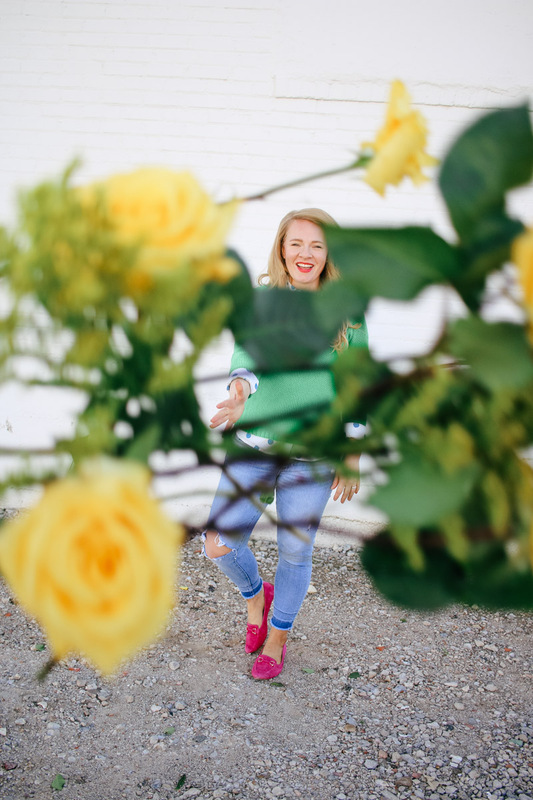 A frequent question I get is how to wear more color in your day to day life without looking crazy. Well I have 3 easy ways you can add a pop of color to your wardrobe & there’s no need to break the bank trying to buy a whole new wardrobe. Adding in color can be a slow & steady change. One of the most affordable & easiest way is to add color to your wardrobe is with a scarf. Both traditional “keep you warm” scarves & their summer sister, a silk scarf can shift an outfit into something a bit more interesting. And here’s the key to that scarf, keep it SOLID. Yes, you want to start creating a colorful wardrobe but by picking a pattern you are limiting what you can wear it with. 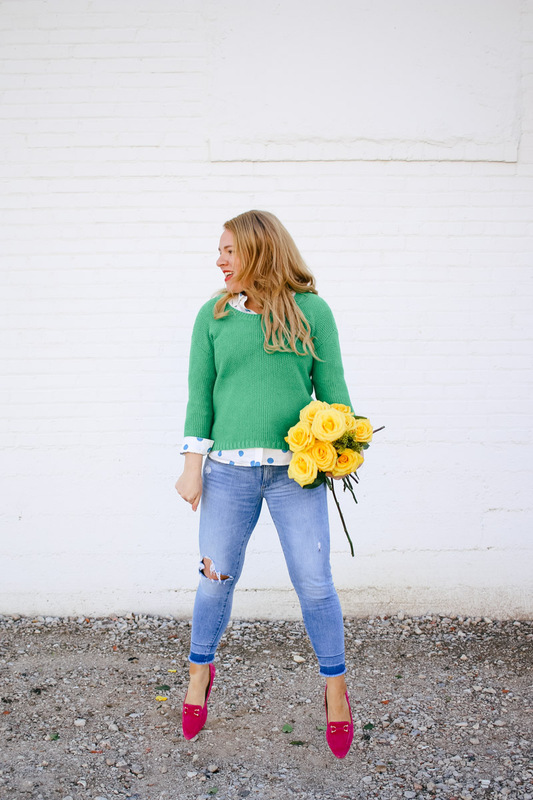 Solid pieces pair so nicely together (like in this outfit I’m wearing, solid green plus solid pink shoes work nicely together). Here are some great options from Amazon that would elevate any neutral outfit in a snap. The shoes, yep I am sure you have plenty of neutral shoes in your closet. Probably more than you would care to mention but have you found your colorful neutral? 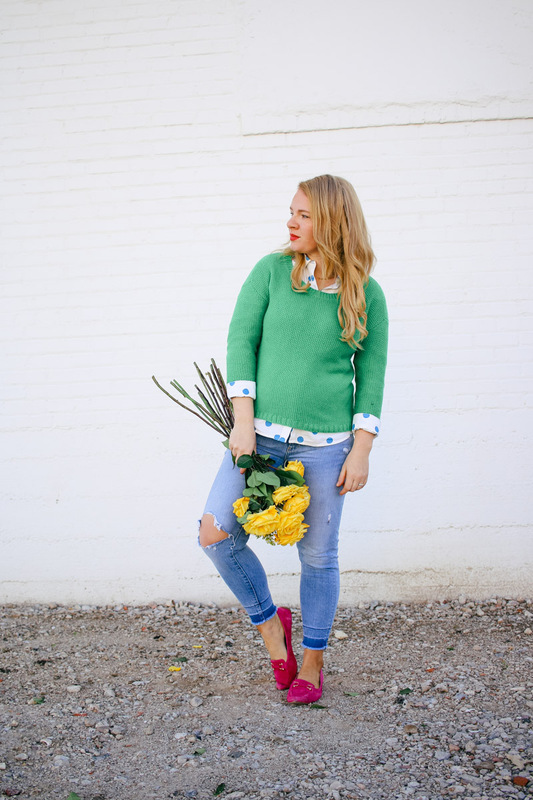 That colorful pair of shoes you can throw on when jeans to & it’s instantly more fashionable? 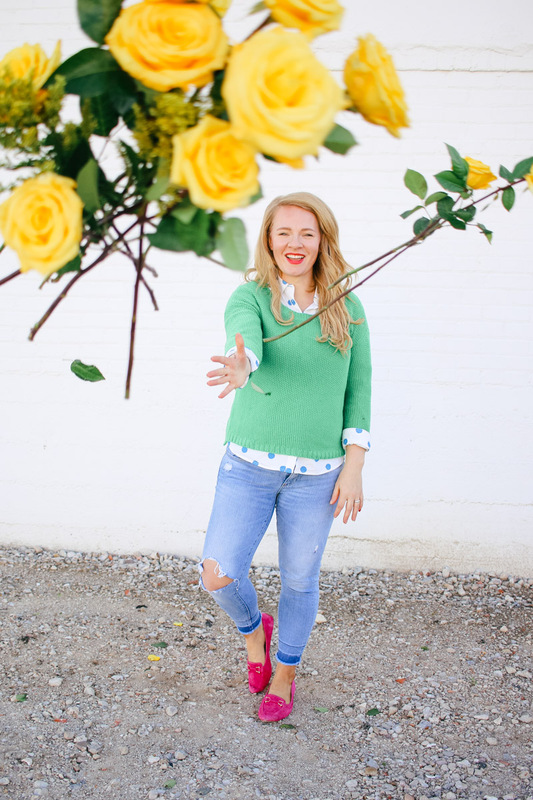 It’s one of my FAVORITE ways to add color to my outfits! I have a few pair of solid but fun colored everyday shoes like these pink loafers. So this rule will help you as you shop, but SOLIDS. 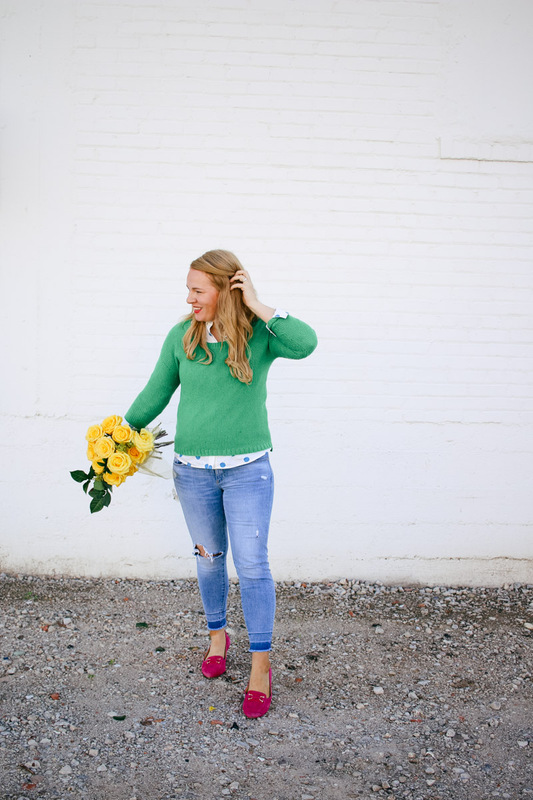 Seriously, I LOVE LOVE LOVE patterns but mixing and matching solid pieces will give you the most bang for your buck & allow you to create a colorful wardrobe in less time. 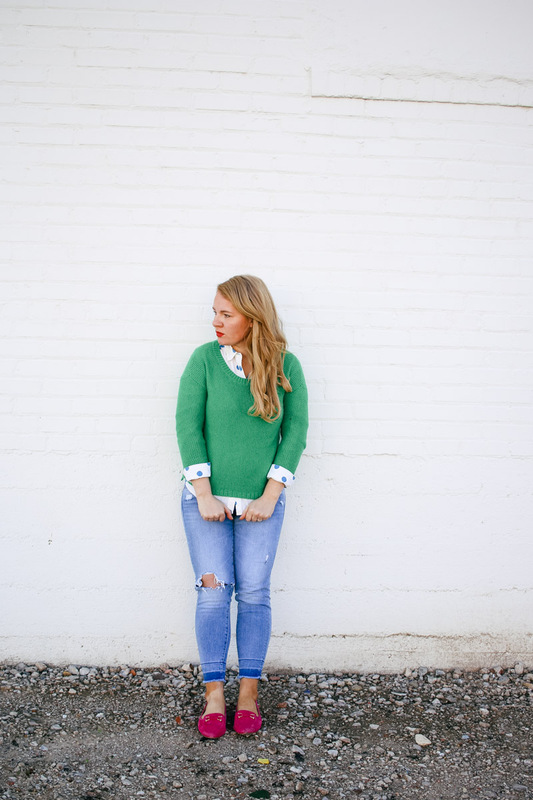 For example, the green sweater in this post can easily be mix & matched with a variety of outfits to add in a punch of color. One way I’ve worn it recently that might be unexpected was over a striped dress to give a plain striped swing dress a bit more of flair (see the IG photo below & if you don’t follow make sure to hit that follow button). While I’m out thrift shopping I try to focus on the solids the most these days to build a wardrobe that is versatile as can be.